Tuesday was Dan's first day in class, it's just him, I and Jillian on Tuesday mornings. 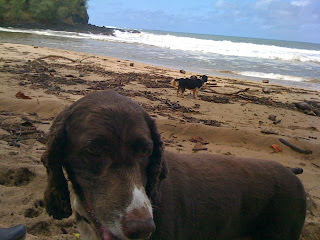 We got to bring the dogs so it took some time to introduce them to Azure (Jillian and Gary's son), Hoku (the farm dog), the goats, chickens and wild boar. After that, the first order of business was to check on the irrigation systems. It's the end of winter so it's still really rainy. So rainy that Monday Dan and I stayed inside (finishing my website and doing homework) during the day long downpour. 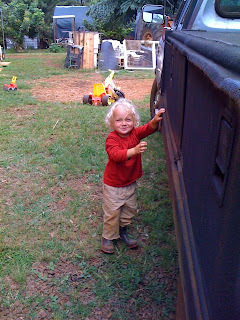 Jillian had left the sprinklers on all day so we needed to turn them off and check on the condition of the farm. Next, we went to the greenhouse and planted seeds. Every week about 1200 new seeds are planted; 7 planting trays, each tray containing 100 to 200 plugs. We planted 3 types of lettuce (I could tell you the names but they'd mean nothing; Ermosa, Tropical, Green Grand Rapids), 2 types of bunching onions (scallions), Kohlrabi, and a tray of cilantro. Then we went into the garden and pulled weeds until lunch. At lunch, we went to the beach. 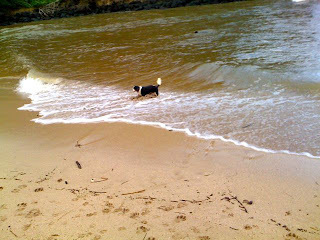 This is where the river meets the ocean 5 minutes from the farm. Back at the farm, Casey joins us and we weed, feed and cultivate the gardens. By this time the dogs were tired out so they laid by the tool shed under the shade of a tree and napped. Turtle came by with three, two foot long catfish that he just caught. He and Jillian discussed when and how to make them. 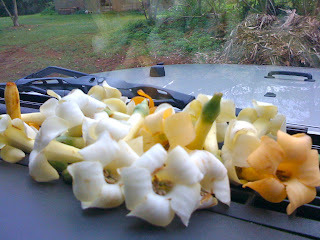 As we were leaving for the day Turtle gave us some flowers to put on our dashboard. Not only did it make the jeep smell great but, it created a feeling of acceptance and safety. This token of love could be seen by all, including the locals who sometimes have issues with haolies. 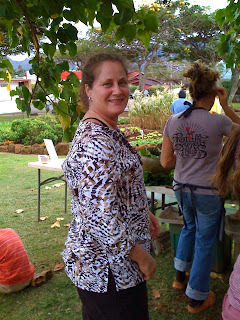 Eileen told us an interesting story about the origin of the word ha'olie. The ancient Hawaiians would greet each other by putting cheek to cheek (imagine the Europeans kissing each side of the cheek in greeting) and exhaling. When the native Hawaiians met Captain Cook for the first time, instead of their traditional greeting, he extended his hand in a hand shake. Ha means "the breath of life" in Hawaii (prana in India, Chi in China, Qi in Japan) olie means without. 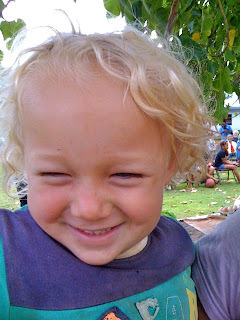 Ha'olie means without breath. When the natives called him that it was not in derogatory reference but in curiosity. 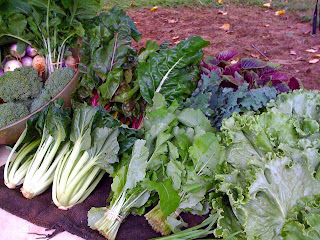 Wednesday morning was harvest for the CSA. It started off nice enough, Jillian assigned me to pick micro-greens from the 75 foot long bed. Four rows of baby beets lining the entire 75 feet. I'd have to do 2 rows and go around to the other side to do the other two rows. Daunted, I set to the task and enjoyed the peace it brought me; meticulous work combined with sunshine, birds chirping and the sound of the ocean in the distant background. Everyone went to their separate harvesting areas and I was left to my thoughts. Sometimes, Eileen's laughter would reach my ears. 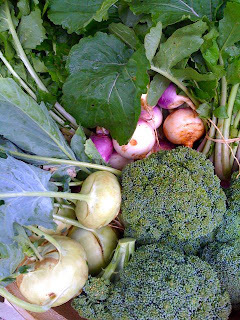 We harvested arugula, amaranth leaves, beet micro-greens, baby turnip greens, cabbage, rainbow chard, garlic chives, fennel, 2 types of Kale, Kohlrabi, 2 types of lettuce, purple globe turnips and Tat Soi . While we were all working, a light sprinkle started for which I was grateful. The rains here turn on and off like a shower and give you no warning. Sometimes they last 30 seconds and it's a nice way to cool off. This was not letting up so Dan brought me one of our raincoats. We kept working and the rain kept pouring. Two and a half hours into the beet bed, drenched, Dan and a new student Teo came to relieve me. I was 25 feet from being done and ready for help. They said Jillian thought that since I'm a chef, I was the obvious choice to make a special salad. 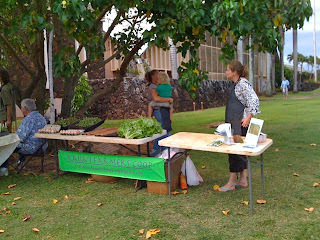 This afternoon we were going to The One Year Celebration of the Mayor's Aloha Garden and we were bringing a salad for people to sample. Jillian instructed me to go into the garden, harvest whatever I wanted and make a salad. 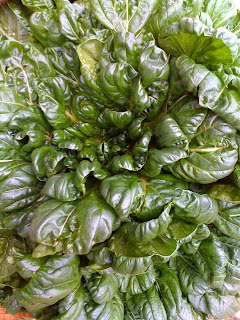 In the pouring rain I got lettuces, carrots, baby beets, radishes, basil, mint, cilantro, spring onions, tat soi, cabbage, mustard greens, baby turnip greens, little white cilantro flowers, light purple garlic chive flowers, maroon, red and gold marigolds and yellow nasturtiums. 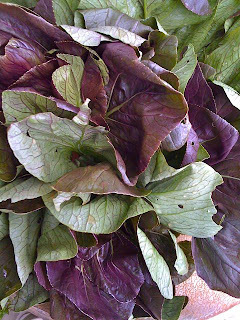 Out of the poring rain and into the farm's kitchen, I washed and assembled the salad while my classmates finished the harvest and clean up. The rain came down so hard and fast, the roof sprung a leak. There I was with spiders in every corner; long dainty legs and big fat bodies dangling in eight wispy webs. The rain was streaming from the roof onto the gas stove so I unplugged the overhead light and worked in the damp shadows. Once the salad was finished, Dan ran in soaking from head to toe and we went to town to get a bowl of soup. We had an hour of class time before we had to leave so we presented our veggie facts. I made a cauliflower salad and printed out my veggie facts for everyone. (I ended up using all the ink on my Kauaian Fresh flyers so Dan could only print one veggie fact). Dan drew the sweet potato in it's immature plant form and the sweet potato itself. We were a little embarrassed as our veggie facts were way above the hand written ones the others did. Over achievers? Maybe. Stew did a really cool drawing of a marigold that we all thought could be a Seed to Table t-shirt. 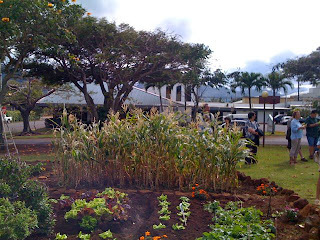 The rain had given up when we set out for the Mayor's celebration sponsored by the Kauai Agriculture Initiative. 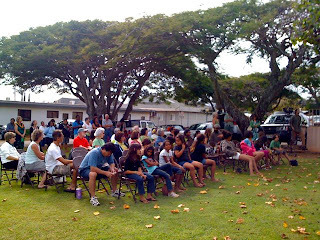 The proceedings started early to avoid the rain and we set up as Larry Rivera sang Aloha Begins With Me. We arranged the salad and produce Jillian brought to sell as well as flyers about the farm, I only had 7 flyers but I laid them out next to Jillian's. As were were getting organized, a well dressed man came up to me and gave me a Hawaiian hello (one kiss to the cheek). Stunned, because I didn't know him, I said hello back and he went on his way. I asked Jillian who that was and she said the Mayor! 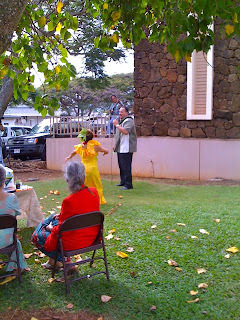 Following Larry, the Mayor had a hula lady dance while he sang Beautiful Kauai. It was fantastic, he sang it with so much love that it brought tears to my eyes. I'd never seen a mayor sing before and to see the mayor of Kauai sing was special indeed. His speech was passionate as well. He explained that 30 years ago the island was completely sustainable but now 90% of the food is imported. As he spoke of a renewed, sustainable Kauai and his efforts to make it so, I felt encouraged about my work. Once everyone was finished giving their presentations the line for the salad formed quickly. I piled the salad high for the first plate and had Dan give it to the mayor. Jillian and Eileen were frantically selling their produce while explaining what things were and how to cook them. 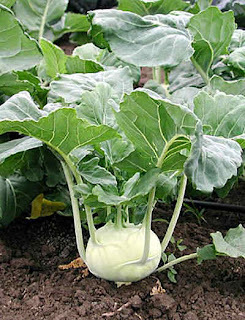 I pointed out what was in the salad to curious folks so they could see the vegetable in it's original form. I got a lot of compliments on the dressing and was asked how to make it. Regina, the mayor's wife, really liked the salad saying the dressing was so light and flavorful. After explaining how to make it, I gave her a flyer and told her to call me if she had any questions. Mary, the mayor's assistant, wanted to know how to cook chard so I gave her some suggestions and a flyer as well. The flyers must have been meant for them because they were the only two left. Me after having been in the garden all morning and rained on until soaking wet. A quick change of clothes and we were ready for the mayor! The table on the far right has my flyers held in place by a coconut. One of the red dirt covered containers, between the tables, hold some of my micro beet greens. 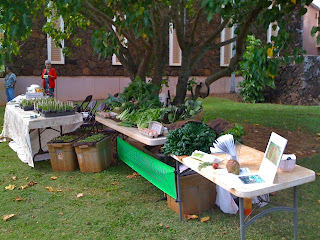 The table on the far left has seedlings from the Kauai high school's key club. 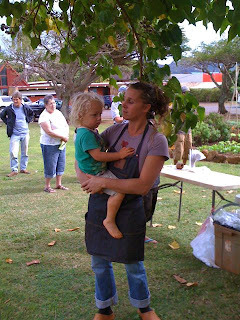 The audience listened as representatives from community gardens, sustainable nurseries, landscapers and farmers explained how they contribute to a healthier Kauai. Teo (Eileen's business partner), Jillian, the mayor and Eileen. While I was serving the salad Dan was talking with the mayor. After explaining that his wife made it from produce harvested that morning and that everything in the salad except the dressing was from the garden, he gave the mayor some ideas. 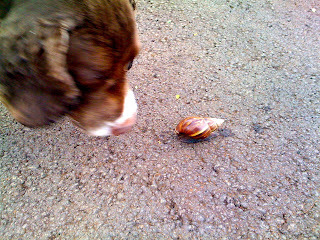 He told him about the markets in Spain and how you could go to one place to get most of your food, all local. 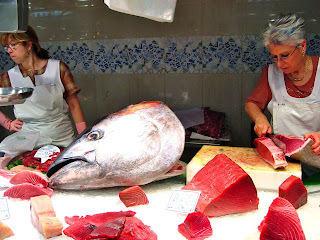 From seafood caught that morning, fresh chicken, pork, beef, lamb, and eggs, to sandwiches, fruit and vegetables. Dan suggested having a market in several towns where local food producers could sell their food, when they had it. It could be very casual, maybe under a canopy and on a first come first served basis, find a spot, set up and sell your food. It would be open every day, as opposed to the farmers markets that are only open one day a week. 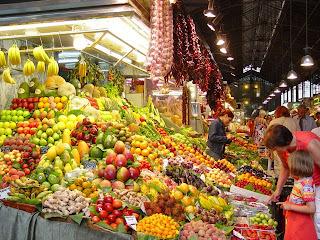 The local people could get their fresh produce daily. 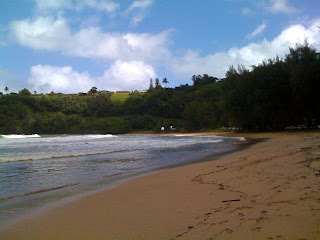 The mayor said he is working with Washington for 2 grants that go directly to the county of Kauai. One is for energy and the other is for sustainable agriculture. Dan explained that the avocados here are amazing and the only place you can buy them is at the farmers markets. The ones in the grocery store are imported from Mexico. He wondered aloud how this could happen. The avocados grown here are fantastic, the ones from Mexico can not compare. Wouldn't it save energy to sell local avocados instead of imported ones? Another man, standing next to them said the carbon footprint on that could easily be figured out. Dan also suggested that the owners of dormant cane fields be taxed higher. The land should be used to grow things like organic avocados, and farmers who do should get a tax break. The mayor listened and Dan was elated that he was able to talk to the mayor in such a candid way about his ideas and not only be heard but seriously considered. On the way to the car Jillian complemented us on our veggie facts and said it was exactly what she was looking for when she was having a website designed. She was trading a CSA share for the website but the lady had a nervous breakdown and it never got done. She always envisioned a page on the site with veggie facts that looked like ours. It looks like Dan will build her a website and she will trade him with the class. $500.00 savings right there! She then hesitated to add (because she was trying to protect us from disaster) that she knew of a beautiful restaurant, fully outfitted with new linens, kitchen and dinnerware, sitting empty. This well off couple has had several people in and out running the cafe, changing their minds all the time. The last she heard, a chef had gone in there and totally decked the place out and it sits empty waiting for the right person. It even has an organic farm AND farmer! Something to think about she says, because she thinks we could be the right people. We are planning on following up and sending the mayor an email. Who knows maybe Dan will work for him! 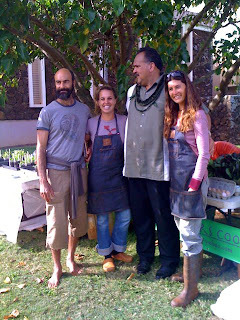 Because of all the curiosity about organic gardens and how to cook produce, Dan and I are expanding Kauaian Fresh to include cooking classes and consultation and installation of organic gardens. I leave you with this beautiful video I found.